Some of you may have thought that my Chemical Ali punishment was on the harsh side, but I'm actually the nice judge in the good-cop/bad-cop team we have going. LeMons Supreme Court Justice Loverman has devised a punishment he calls the "Diabetic Discipline," and it goes something like this: We take some bribe money and send a local guy- we tried to find one with a cruel streak- out to buy the most grotacious food products he can find. Since this is South Carolina... well, make the jump to get the whole story. We got Potted Meat Product. We got everything out of the Little Debbie playbook. We got hot sauce, Circus Peanuts, Junior Johnson Pork Cracklins, and sardines. We've even got some kind of blindingly sweet crypto-cherry soda called Cheerwine. Best of all, we got canned pork brains! 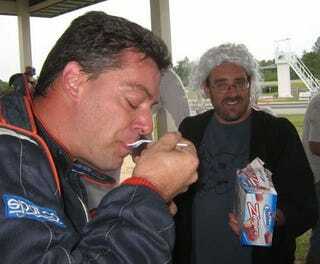 So here comes a team with a driver who passed on a yellow flag; he can cost his team a half-hour's worth of laps by sitting the car in the time-out zone... or he can eat his way out of the penalty. This guy was a real man- a hero, in fact- taking one for the team by scarfing a can of pork brains, six strawberry Zingers, and a Cheerwine... with hot sauce on everything! Yeah, he puked a bit, but his team is still contending! Since then we've had a guy choke down a can of sardines, a half-dozen Little Debbie Chocolate Peach Jelly Torpedoes, and a Cheerwine... and another team opt for the full thirty minutes rather than face our next multi-course meal. Now that the word has gotten out, many teams are having agonizing debates about which choice to make if they find themselves in the Court of LeMons Law.